Product prices and availability are accurate as of 2019-04-10 00:53:26 EDT and are subject to change. Any price and availability information displayed on http://www.amazon.com/ at the time of purchase will apply to the purchase of this product. Natural boars bristles are gentle to teeth and gums and their hardness can be adjusted according to your personal needs by following these instructions: before using the toothbrush for the first time wash the head in warm water. Every now and then pour boiling water over the bristles. It is recommended to use two toothbrushes: one in the morning, the other in the evening - this way the wood and the bristles can dry properly and the toothbrush stays hygienic and last longer. 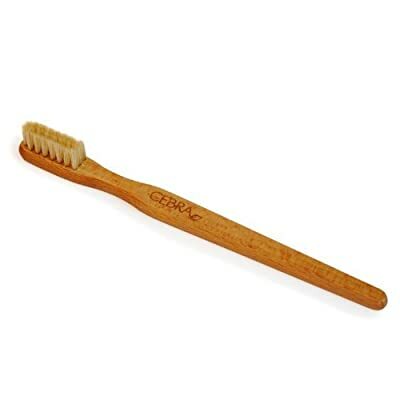 If you are using a wooden toothbrush for the first time you may need a few days getting used to it.